Guy Harvey wears many hats. 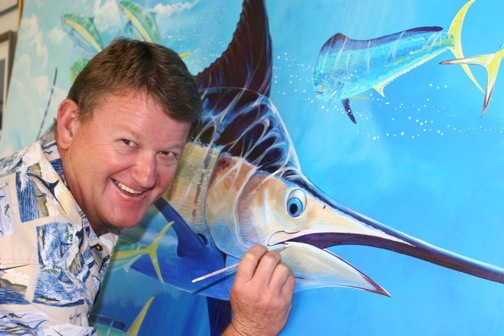 He’s best known as a wildlife artist, whose stunningly realistic portraits of marine life have made his brand immensely popular with fishermen. The chain of seafood restaurants bearing his name, Guy Harvey’s Island Grill, includes locations in Florida, Alabama, South Carolina, Texas and the Cayman Islands. 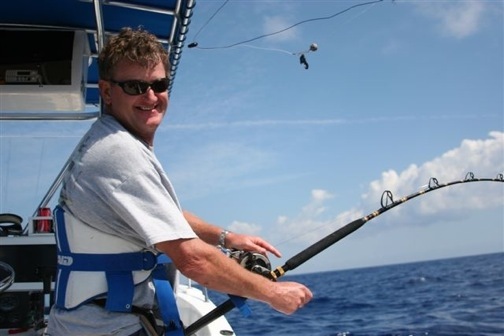 There are Guy Harvey books, clothing, boat wraps and DVDs, charting his adventures as an avid angler and diver. But, if you ask Harvey, his most important efforts come from his lifelong work as a marine conservationist. A 10th generation Jamaican of English heritage, Harvey studied marine biology at Scotland’s Aberdeen University before getting his PhD in Fisheries Management in 1982. He found a way to combine his love of art and the sea in the mid-‘80s, but never stopped studying the ocean and fighting to preserve the creatures that inhabit it. For years he’s donated proceeds from sales of his art to protect marine life and advocate for sustainable fishing. And in 1999 he teamed with Ft Lauderdale’s Nova Southeastern University to found the Guy Harvey Research Institute, which conducts research on the ecology and conservation of sharks and stingrays, artificial reef design and more. We recently spoke to Harvey about the prominent issues facing marine life today, and what the average person can do to help keep our oceans healthy for generations to come. How do you think growing up in the Caribbean influenced your interest in marine biology? I grew up in southwest Jamaica, where my parents farmed beef cattle. They also had a small beach cottage on the coast at Belmontand both loved fishing. My Dad had a 26-foot long canoe built, with an outboard engine, bamboo outriggers and a local fisherman to guide him. Each time I was at home on school holidays I went fishing with my parents or a local charter boat captain. My desire to learn more about fish and, subsequently, to study and paint them originated from these early experiences. You got your PhD in Fisheries Management. At what point did art go from being a hobby to a career? The transition was slow. I was busy finishing up my PhD thesis, and then began teaching while there were increasing demands for my work in Florida. By 1986 my work was appearing on apparel, and I signed a contract with T-Shirts Of Florida. I resigned from the University of the West Indies and went full-time into the production of art. My style broadened to include watercolor, oil and acrylic paint, but my strength was in my knowledge of the anatomy, physiology and ecology of the animals I painted. Do you remember a certain revelation that took you from merely appreciating marine life to feeling compelled to protect it? As the Guy Harvey brand became more successful, I traveled more in search of new angling and diving experiences. Conservation issues appeared on my radar screen and, as I spent a lot of time specializing in interactions with large oceanic fish, the predicament facing sharks, billfish and tunas became a priority. I learned that industrial fishing, such as long-lining and gill-netting indiscriminately, had a huge amount of by-catch or non-targeted species that were discarded. Most offensive was the issue of shark-finning. This is a diabolical practice where sharks are caught, their fins removed and their bodies discarded overboard while still alive. So much abuse of marine species happens at sea, out of sight of the public. What are the most pressing issues facing marine life today? Overpopulation is the greatest threat. Many species of sharks, tuna, billfish, turtles, rays groupers, cod, etc., have been over-extracted, and their recovery will take decades even if we stop today. This is a far greater threat than other issues, such as global warming. Substituting the protein we obtain from seafood consumption is one way to reduce our impact on marine species. Farming certain species is another option. The Guy Harvey Research Institute publishes a seafood guide to assist the public in making the best choices when consuming seafood. There are certain types of seafood you refuse to serve at your restaurants. Local species such as yellowfin tuna, wahoo, dolphin (mahi), snapper, rainbow runner are all served when available, as well as lobster and conch in season. But certain fish species, including king mackerel, barracuda, amberjack and large groupers, can bio-accumulate certain toxins that can be poisonous to consumers. Other species have a high-mercury content that’s unacceptable for consumption. In the Cayman Islands, large reef fish are far more valuable as a living resource than they are as a filet. 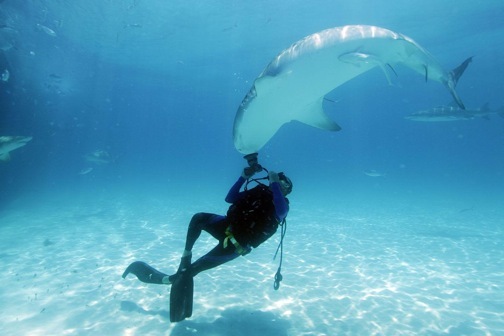 Reef fishing is incompatible with an active diving industry as the focal point of Cayman’s tourism sector. What are some of the more intriguing things you’ve discovered through the GHRI’s work with Nova Southeastern University? Shark research has been a priority because these animals face serious threats. Perhaps the most rewarding projects have come from long-term tracking of tiger sharks tagged in Bermuda, USVI, Bahamas and Grand Cayman. We also work on groupers, billfish and rays, and collaborate with a number of other fishery research institutions. My licensees all contribute funds and assist in the conservation effort. 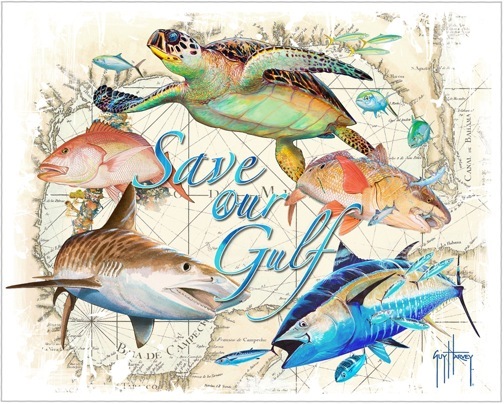 I’m very strong on Cause Marketing, and let all customers know that, in buying any Guy Harvey merchandise, they’re supporting marine conservation and education. What can the average person can do to ensure the future health of our oceans?